When it comes to celebrating the holidays and time with family & friends, I like to keep the party prep time simple and quick. I look for pre-made party trays to help me keep it easy. HORMEL Gatherings has the perfect Party Tray that is versatile for all types of events from football games and tailgate parties, to holiday gatherings and family get togethers. I recently had the opportunity to review their Supreme Party Tray with hard Salami and Pepperoni. This Hormel Party tray was simple to find at my near by Wal-Mart in the meat and cheese department. It can easily feed a good size crowd for your holiday parties this season. 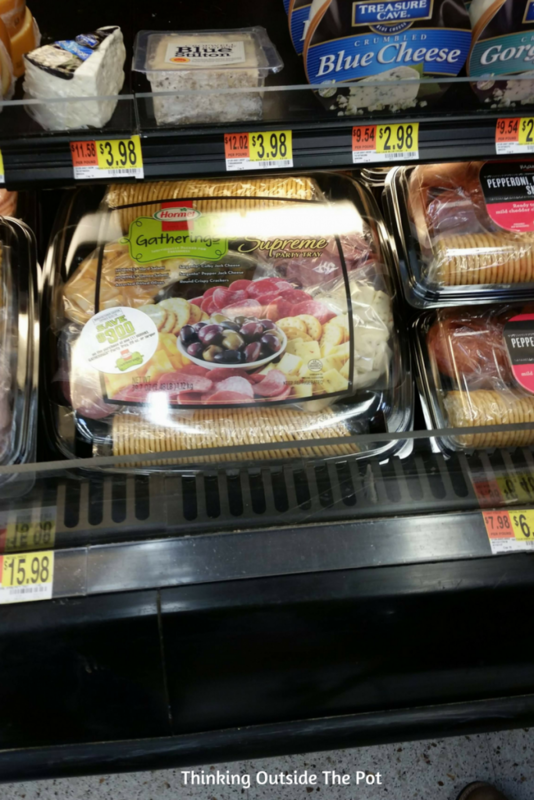 Hormel offers other party trays such as the Hard Salami & Pepperoni Party tray and the Honey Ham & Turkey Party tray. 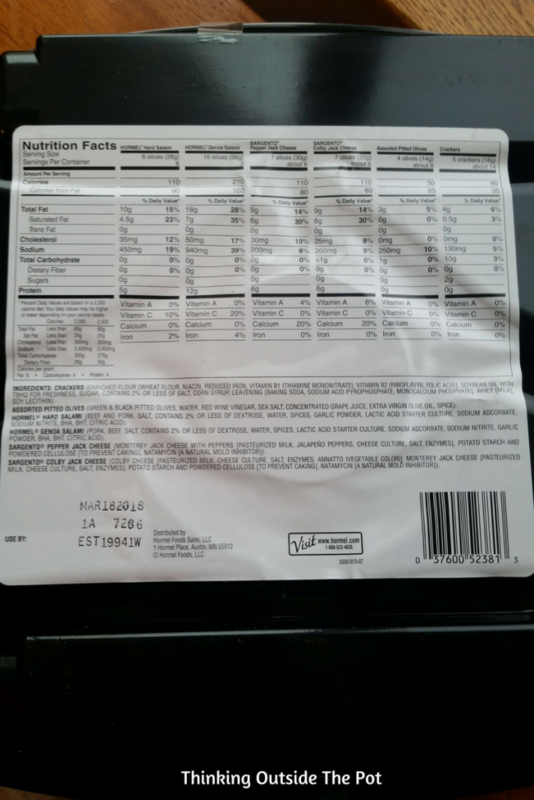 My Wal-mart and other grocery stores in my area did not have them just the Supreme party tray was. This may vary from area to area. This party tray is full of Hormel Hard Salami, Hormel Genoa Salami, Sargento Colby Jack Cheese, Sargento Pepper Jack Cheese, Round Crispy Crackers and an Assorted Pitted Olives. It all comes in individual packages to keep it nice and fresh until you are ready to use it, and this party tray is full of great nutrition! My family loved this during our Thanksgiving get together. It was a huge hit. 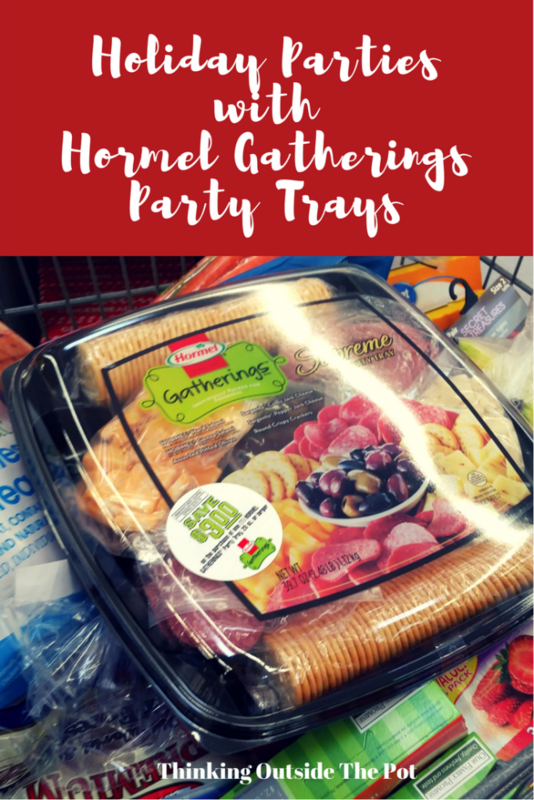 I can’t wait to try more of Hormel’s Gatherings Party Trays for our Christmas and New Years parties. The crackers were buttery and flaky, and the cheese was my favorite. They both had a great taste to them. It was the perfect combination with the Salami and crackers. I was impressed with how fresh this party tray was. A great product to buy ahead of time to prep for your holiday celebrations. For storing if you have some leftover after your event, I recommend separating the crackers and storing in a plastic bag on your counter as they may become soggy stored in the fridge. We had a lot of fun enjoying our Hormel Gatherings Party Tray. The price for this party tray was $15.98 at my near by Wal-Mart. Not too bad of the price for the amount of people you can feed with this party tray. I want to giveaway 2 Save $15.00 on and 1 Hormel Gatherings Party Trays 28 oz or larger. If you win this coupon you could pay $0.58 for this party tray. What a great way to save some money when hosting all your holiday parties. I hope you have a very Merry Christmas or New Years celebrating with this yummy Hormel Gatherings Party Tray!